Rules exist for a purpose. They don’t exist just for their own sake. Allah Almighty has not imposed a way of living upon Muslims just to make their lives difficult or just for some arbitrary reason. Take the example of a young Muslim man at university. We will call him Ahmed. On a Friday night Ahmed’s non-Muslim friends invited him to go to the disco with them that night. Clearly no one has ever explained to Ahmed just why as a Muslim he can’t go to the disco to meet girls or to have a few beers. Islam, to him, has just become a set of rules and regulations to spoil his fun. He doesn’t realize that behind every single teaching of Islam there is a good reason – and a reason that is good for him. Let us change the example and the idea. Imagine that someone goes into town and buys himself or herself a new mobile phone. He would be very foolish when he got the phone back home not to read the instructions to see how to get the best out of his new phone. Clearly, the maker’s Instructions will guide him how to do that. If he doesn’t follow the instructions then he might run the battery down or damage the phone in some other way. Muslims are just like this. The Maker of all things, not just of a phone, has given instructions as to how we can make the most of this life and even inherit life in the world to come in paradise. Yet too often we choose to ignore the Maker’s Instructions, preferring to go our own way instead, even though Allah Almighty knows us far better than we even know ourselves. Once again, we often seem to think that all the information we have received about Islam and all the directions and instructions we have received about how to live are somehow not really in our best interest. It is as if all we have learned has not touched us at all in any deep way. It has become information, but it hasn’t transformed our lives. Allah Almighty has spoken to His creation throughout history. His final revelation to mankind, the noble Quran, is for all people and for all time. In its beautiful verses we learn what Allah is like and how He has dealt with us since the beginning of time. In every step he took and in every word he spoke, Prophet Muhammad (peace be upon him) fulfilled what the Quran had taught and showed Muslims how to put this teaching into practice. This life and teaching of Prophet Muhammad (peace be upon him), or Sunnah, is a Sunnah of Love. 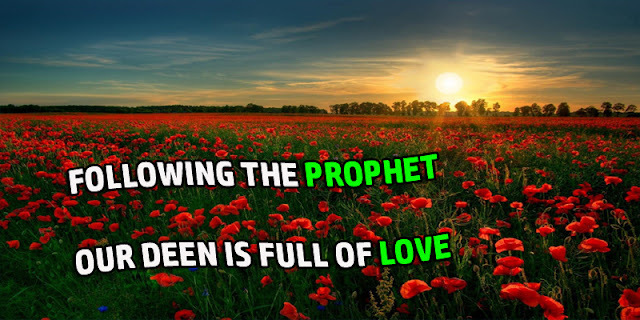 The life and words of Prophet Muhammad (peace be upon him) complete our understanding of Allah’s revelation because they show us that a deep love for Allah and love and care for one another is at the very heart of Islam. No amount of information or rules and regulations will lead us anywhere without the guiding example of Prophet Muhammad. Indeed, a Christian bishop from the Middle East was once heard to remark that he would gladly see Shariah Law introduced into his country on the condition that it was accompanied by the manners of Prophet Muhammad (peace be upon him). All of the knowledge we gain must be learned in equal part with knowledge about how Muhammad (peace be upon him) put that knowledge into practice. At the very heart of Islam is the very way we talk about Almighty God, Allah. Throughout the Quran we say that He is Merciful and Compassionate. In fact, it is not we who say it, but it is Allah who says this of Himself. He describes Himself as Merciful and Compassionate. Surely, then, as followers of the Merciful One, the Compassionate One, we should in all things try to be merciful and compassionate ourselves. Throughout his life, Prophet Muhammad (peace be upon him) drew others to himself and to Islam by the respectful good manners he showed towards them. This loving charity is at the heart of Islam. Prophet Muhammad (peace be upon him) even gave us the example of a woman (and not the most respectful of women) who would enter Paradise because she gave water to a thirsty dog. To a dog! How much more we will enter Paradise, then, if we are kind and generous to those in need around us? Twining his two fingers together, he held them up and said that a man who is kind to orphans will enter Paradise alongside the Prophet as closely together as those fingers were twined together. Again and again the same theme is repeated. Love and respect to our parents will lead us to Paradise. Love for our mother will lead us to Paradise. The kind way a husband treats his wife will lead him to Paradise. Loving kindness is right at the heart of what Muslims believe. They may not have artistic images of their Prophet surrounded by fluffy clouds and little children at his feet, or sculptures of their Prophet suffering in torment on a cross for the sins of others, but their belief in Prophet Muhammad’s life of service to others is total. Their certainty of his deep love for Allah is unshakeable. As Muslims we are called to study our deen very deeply and to gain as much information as we can. That study and that knowledge will include the Seerah of Prophet Muhammad. If our young student, Ahmed, managed to learn these things, he would know that Allah cares for us with an infinite care and that Islam provides him with the best way of living. Indeed, Islam will lead him to live a life that is full. And the One who is Merciful and Compassionate will lead him, inshallah, through this world to the reward of another, where the passing pleasures that so enthralled us will have no appeal. Our love will be for Allah Alone.